One of my jewellery things to do is to do filigree work. So I decided to make a start by making a filigree pendant. 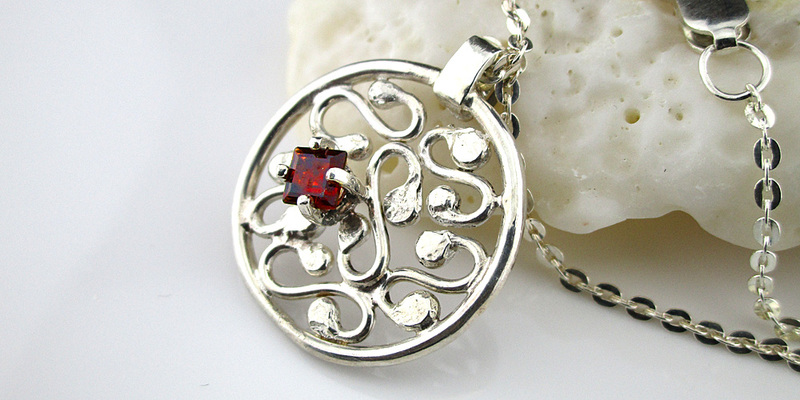 The pendant I decided to do was to make a round circle pendant filled with a filigree design and put a square red garnet set in a round sterling silver setting set on top of the filigree. The first thing to do was to make a sterling silver ring with round sterling silver wire. Once That was ready I cut some short pieces of sterling silver wire. Then I balled each end by holding it in the torch flame. Once the wire pieces were balled on each end, I then shaped them into an S shape with a Webber tool. I then arranged the S shaped pieces into the inside of the ring and then soldered them all together. The next step was to solder the sterling silver round stone setting on the filigree. Then to polish it. I Place it in my tumbler container and tumbled it for a couple of hours then once that was finished I dried it off and gave it a final polish next step was to set the square garnet. Previous post: I called it a Fertility Bowl!